It's probably fair to say that rc 'drones' have taken the radio control flying hobby by storm, and have had both positive and negative effects on the hobby. But what is a drone, and are there even beginner rc drones, or are they all too complex? Well, if you look for an official definition of the word, you'll see that a drone is an unmanned aircraft which is flown autonomously i.e. without a human pilot sat in a cockpit controlling it. In other words, it's an aircraft that is capable of flying on its own either by following a pre-programmed flight path or by responding to control inputs being made by a human based somewhere away from the drone. Drones are also referred to as UAVs, or Unmanned Aerial Vehicles, but the word drone is easier to say and so that's the word that's been adopted, not least by the world's media when talking about such aircraft - whether full size drones or rc ones. 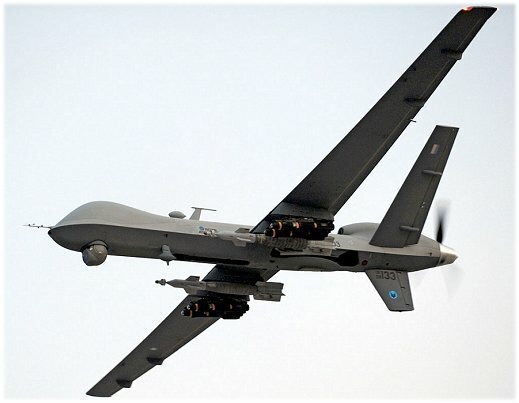 A good example of a full size drone would be the Reaper (shown below), used by various countries to perform aerial reconnaissance and attack roles. In the rc world, the name drone is widely used to describe what were once commonly known as rc multicopters. The name multicopter is actually an umbrella name that covers various multi-rotor aircraft, for example quadcopters (4 rotors), hexcopters (6 rotors), octocopters (8 rotors) and so on. And it's these aircraft that have really changed the radio control flying hobby - but for the better, or worse?? Above: RC drones, aka multicopters, come in many sizes and shapes. OK, I'll admit that I have very mixed feelings about rc drones. For a start, I personally don't like the name drone. Every time I hear it, I think of something like the Reaper rather than a friendly little radio controlled aircraft. But it looks like we have to live with the name, since this is the name that the media - and now manufacturers of them - are forcing us to adopt. Secondly, noisy drones annoy me! Not the little micro ones, but the larger ones that sound like a swarm of a million mosquitoes coming at you. This is especially true of the cheaper ones from lesser-known manufacturers. It's true that rc drones can be surprisingly quiet with the right blades fitted, but there are a lot of noisy ones out there. I also, more importantly, dislike the fact that rc drones seem to be annihilating the traditional airplane and helicopter side of the hobby. They've just stormed in and taken over the place, without asking first! So what do I like about these annoying little aircraft? Well, not much to be honest, but the fact that they are rc aircraft does get them a brownie point - anything rc gets my vote. Also, they have brought a lot of people in to the hobby, people who might just turn to planes and/or helicopters later on. And drones do make excellent camera platforms, whether for personal FPV use or general aerial photography, or for commercial use. And let's face it, footage very obviously taken from an rc drone is now a daily thing on our TV screens, so they do have important and very practical uses. Where once a full size helicopter was needed to get a particular shot, now a radio control drone can do the job at a fraction of the cost. So, then, I have an up and down relationship with drones, but how good are they for the beginner to the hobby? Well, the only positive things I can see about them - as far as the complete newcomer is concerned - is that they do bring people's attention to the general radio control flying hobby, and they are easy to fly. Too easy, really, since practically anyone can buy one, take it home, charge the battery and fly it without having any prior experience of controlling a model aircraft. And why is that bad, I hear you ask? Because the beginner rc pilots who buy these drones are not getting truly involved in the hobby, and many people have no idea that rc flying is regulated by governing bodies (at least in the Western World). In other words, there are strict rules to abide by when flying rc drones, and you being a complete newbie doesn't exempt you from those rules! Indeed, it's this lack of experience and knowledge that has led to rc drones - typically being flown by beginners - giving the radio control flying hobby some bad publicity in recent times; there have been several cases of irresponsible drone flying picked up by the media, which reflects badly on all of us. But of course that's not to say that all beginner rc drone pilots are going to fly irresponsibly, because the majority are not - it's just a lack of understanding by some. If anything, the fault lies with the manufacturers who have made buying and flying an rc drone all too easy, and without educating the people about them. RC drones are here to stay, although part of me hopes that they are a flash in the pan and so my little website, rc-airplane-world.com, can recover from the takeover. Realistically, however, governing bodies (links further down the page) have embraced rc drones and here in the UK the British Model Flying Association (BMFA - America's AMA equivalent) and the Civil Aviation Authority (CAA - America's FAA equivalent) are working together to make drone flying safer. They are doing their best to educate drone pilots; for example, April 2016 saw the first Drone Awareness month, would you believe! That's a good and sensible thing of course, but for the trad rc plane and helicopter lovers out there (like me), it's another nail in the coffin for our side of the hobby. But who knows what the future holds - perhaps everything will change the day a terrorist group uses an rc drone to carry out an horrendous attack over a crowded place (to be perfectly honest, I'm surprised it hasn't already happened). Or perhaps the natural circle of life will bring planes and helicopters back to their previous levels of popularity? Anyway, enough of my droning! Someone shut me up! There is a multitude of multicopters out there, but if you are in the market for such an aircraft then don't go wild to begin with. Although drones are easy to fly, relative to rc planes and helis, they are not completely crash proof and idiot proof. Furthermore, if you're using one with a camera, it is very easy to lose concentration and/or become disoriented and accidentally fly the drone out of Line of Sight (LOS) and either in to danger, or out of range and never to be seen again. It's happened lots, believe me! (One of the strict rules for flying any radio controlled aircraft is to keep it LOS i.e. never let it out of sight). So don't buy anything too expensive to start with. There are plenty of micro multicopters out there which are perfectly suitable for the beginner, are cheap to buy (stupidly cheap, in fact) and won't break too badly when they crash. Some won't break at all! Such a drone is excellent for flying indoors, which means you're not going to lose it around the neighbourhood. Also, once mastered, such drones usually have 'tricks' programmed in to them, so are capable of 360° flips and the like. Or some can even be flipped 180° to inverted and 'landed' on a ceiling. But as for basic flying, there really is not much to learn and the instruction manual should tell you everything you need to know. Different manufacturers might use different controls to perform the flips etc (pressing a separate button on the transmitter, or pushing one of the sticks inwards, for example). Basic flying (i.e. 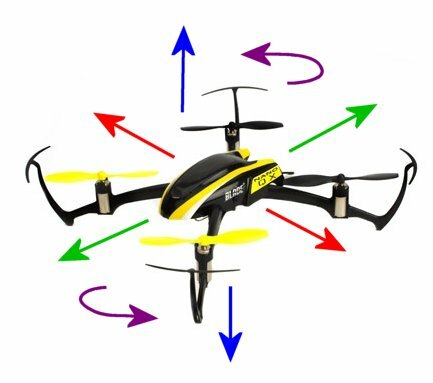 no stunts) will be performed by using the two sticks on the transmitter to control the drone - you'll have fore/aft control ( green arrows in the picture below ), left/right rotational control ( purple ), left/right sideways control ( red ) and up/down control ( blue ). In other words, an rc drone can move in any and every direction possible, just like a helicopter can. An rc drone makes its moves as a result of an electronic flight controller responding to your stick inputs. Very basically speaking, the flight controller adjusts the speed of the appropriate motors accordingly, and the resulting changes of thrust moves the drone in the desired direction. More advanced drones can even have their motor direction reversed in a split-second by the flight controller, and this feature is becoming more common as drones get more advanced. Reversing the motor direction basically means sustained inverted flight is possible, and more advanced '3D' tricks are flyable. So, then, beginner rc drones are widely available these days, albeit at a cost to the poor planes and helicopters. Remember, buying something small and cheap is better to start with, and if you want to fly your drone indoors around the house then get something no bigger than your hand. Also buy one that carries a range of spare parts - particularly the rotor blades that can fly off and easily become lost. Shopping for beginner RC drones? Use these links to visit the website of your country's governing body for radio control flying, to learn about the rules and regulations. Please don't think you can fly a drone in any old place and in any old manner - always check the laws first! Buddy The Drone children's book, available on Amazon UK.